Civic dignitaries and a host of organisations attended a packed charity reception dinner at Hartlepool’s Nasir Mosque. The Mayors of Hartlepool, Durham and Darlington joined guests from the local community at the mosque in Brougham Terrace to hear about an annual Charity Walk for Peace at Windsor Great Park on Sunday organised by the Ahmadiyya Muslim movement. Mayor of Hartlepool Councillor Paul Beck Guests had the opportunity to meet the organisers and sponsors of the peace walk and heard about its aims, objectives, and fundraising efforts over the last year. 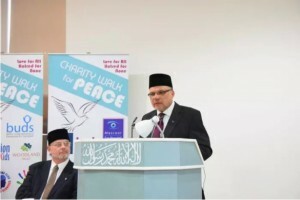 In the past five years the Walk for Peace has raised £1.3 million for 136 local, national and mayoral charities including £250,000 to the Queen’s charitable cause. Organisers explained they are planning to hold a regional walk in Hartlepool next year to support local causes Tahir Selby, Imam of the Nasir Mosque, said on the reception was an important opportunity to bring representatives from many local charities together. Mustjab Khokhar and panel The Chairman of the Charity Walk for Peace, Zaheer Ahmed, said: “This year’s Charity Walk for Peace carries a special emotion for us all as it is being held in Windsor Great Park and follows Her Majesty the Queen’s birthday and precedes the upcoming Royal Wedding in May. “We are delighted to be in the middle of two Royal celebrations and as we are raising a £1,000,000 for UK Charities, it makes this year’s walk very unique and special. “We are very much looking forward to the 5,000 plus participants on the day on April 29.” The three mayors spoke about the charities they are supporting this year. Father Graeme Butteryof St Oswald’s Church Victoria ward councillor Katie Trueman also attended and was a guest speaker plus Father Graeme Buttery of St Oswald’s Church. Representatives from a host of local organisations also spoke about their work and involvement in this years Charity Walk for Peace. They included Alice House Hospice, Artium, Epilepsy Outlook, Friends of Hartlepool Wild Green Spaces, the Great North Air Ambulance and the Wharton Trust.